While the new iPad2 is thinner, faster, and lighter than its older brother, it is NOT any tougher. We don’t mean to imply that iPads are not rugged. The screen is very scratch resistant, the frame is carved from a solid piece of aluminum, and the data storage is based on solid state flash memory. If dropped, as long as the screen does not hit a sharp/hard object, it will likely survive. Still, none of us would really care to find out. To that end, most users treat their iPads with kid gloves: we put on screen covers, wipe off fingerprints, and gently place the tablet in a stand when not used. We all know that the tablet will not play nice with water and will definitely not bounce when dropped, but there are users (photographers, scientists, etc…) who need to take their iPads out in the wild. No matter how careful they are, it is inevitable that an iPad will take an occassional tumble. While no case can help if the iPad goes for a swim, there are some that can prevent disaster if it takes flight. The name that automatically comes to mind whenever rugged protection is discussed is Otterbox. Now, thanks to the suggestions of a few readers, we have learned a new name: Gumdrop. In this FirstLook report, we’ll take a closer look at both offerings. 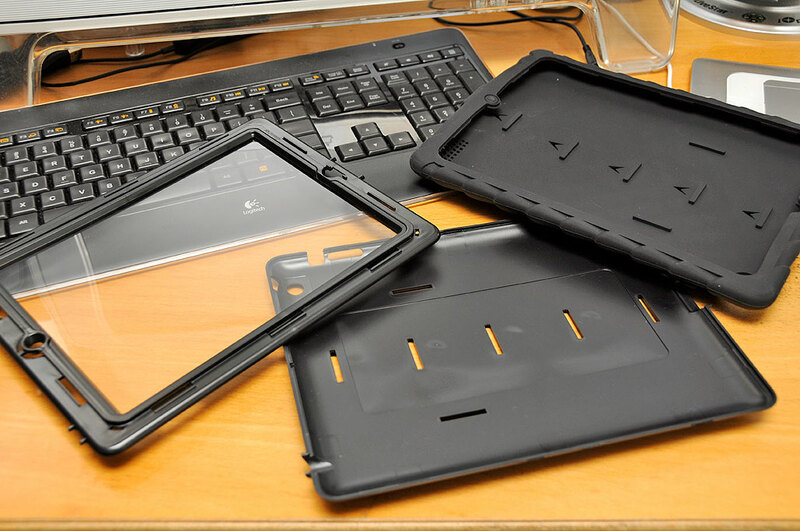 Cases like the BubbleSleeve and StreetSkin that we looked at back in May provide reasonable bump protection for the iPad2, but they may not be right for more challenging environments. 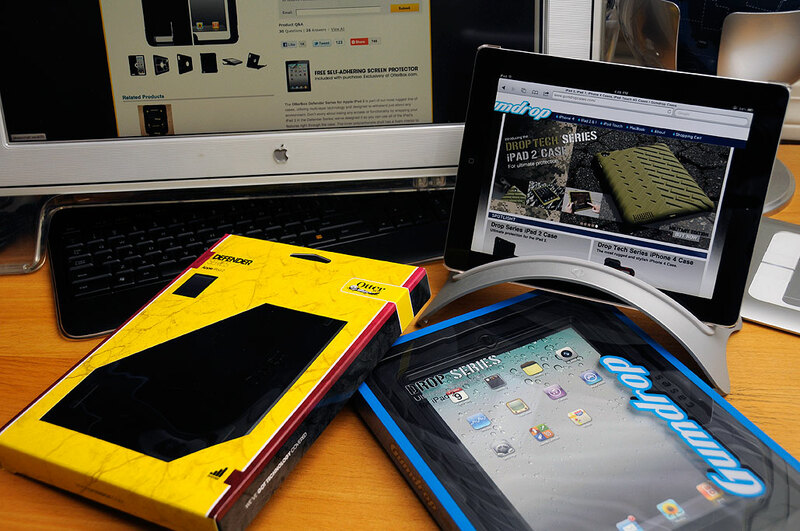 The DropTech Series from Gumdrop was created to shield the iPad2 from more than just bumps and bruises. It blocks dirt, dust, and grime from the various openings on the perimeter of the device. Instead of having to apply a film to protect the iPad screen, Gumdrop has integrated the film into the front frame. Should the skin ever get damaged, it is snap-in replaceable. The Otterbox Defender for the original iPad was pretty amazing because of the multi-layer protection (rubber skin over hard plastic casing). The Defender for the iPad2 is similar, but Otterbox has taken the original design and made some usability improvements. The most notable change is the simplified back frame. The original two-piece frame was a little tricky to install and remove. It is now a one piece unit. Note the foam integrated into the back frame. The foam raises the iPad and keeps it from making direct contact with the frame, creating a layer of air. This should serve both as a cushion and create better circulation for heat dissipation. 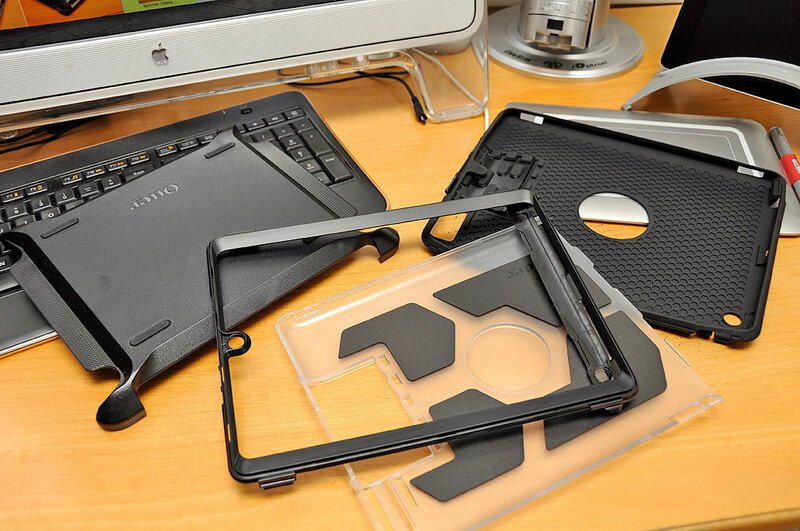 Like the Otterbox Defender for the original iPad, there are rubber covers for all the buttons and ports. Unlike the Gumdrop unit, the Defender has a front cover to protect the screen during transport. The cover will snap onto the back of the case and be out of the way during use. Also like the first Defender, integrated into the cover is a built-in stand. If you want total front/back protection, the Otterbox Defender is still the only game in town. The two cases (Gumdrop DropTech, Otterbox Defender ) in this FirstLook review are not for everybody. In order to offer the maximum level of protection, the cases will make the iPad significantly thicker and heavier. So if you want light and thin, these are not for you. While there are situations where we would happily trade thickness for protection and extra grip, these cases may be a bit much for normal daily use. However, if dust, dirt, and grime are the environments you and your iPad will operate in, these cases may be exactly what are called for. Also, if you know someone with butterfingers or who may be less gentle with their gear than they should, these may be good cases for them as well. Look for the installation and FirstUse write-ups later in the week. NOTE: We are always interested in finding the best protection we can for the iPad, even if we don’t always have it so protected. If you think you know of something better, drop us a note. We’ll be happy to take a look.